In the middle of a ballroom, the lovers dance; her flowing locks and gown twirl into a dreamy blur as they match each other step for step. Spellbound, they gaze into each other’s eyes; nothing else matters. 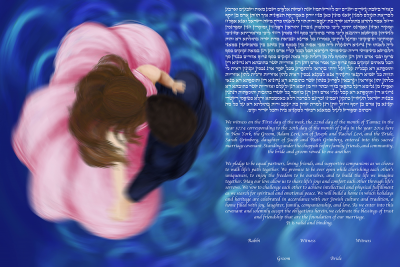 Inspired by “Sleeping Beauty”, this ketubah captures the magic of a fairytale romance–true love and unwavering devotion, come what may. Once Upon a Dream (Pink) is perfect for the romantic couple that feel like they’ve always known each other. You swayed to the rhythm of your own song, till you met a stranger singing a familiar tune. Waltz away to your Happily Ever After with your prince or princess in your arms; dragons don’t stand a chance.